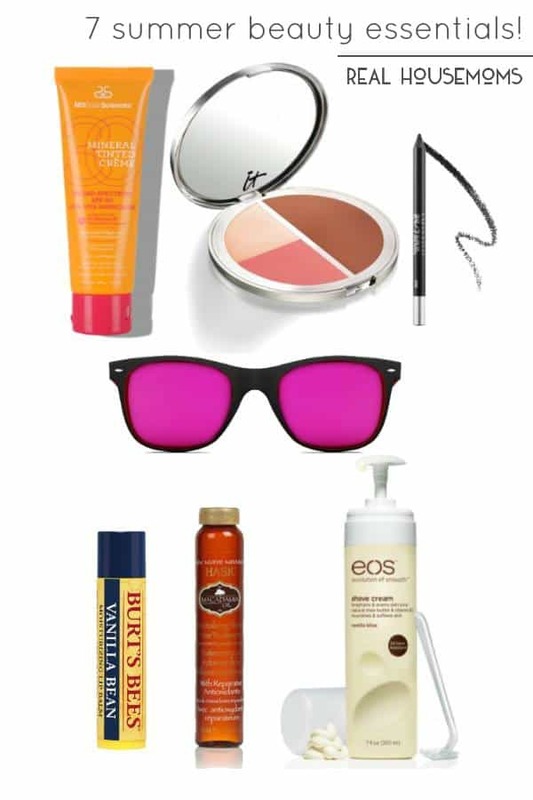 Today I am back to share with you some of what I consider beauty essentials for the summer! 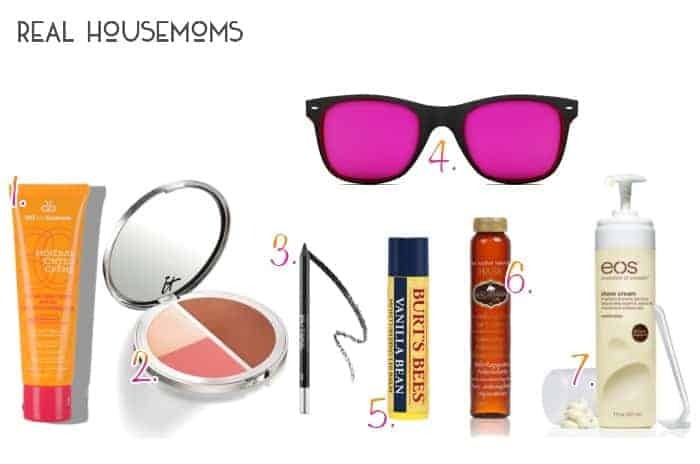 Because its so hot and most of us are on the go for vacations, camping or on the water during the Summer – I’ve included items that are super low maintenance yet provide great benefits for your skin to keep you looking gorgeous and most importantly youthful! I hope you find it helpful and interesting! -Antioxidants: Vitamin C, green tea, cranberry fruit and pomegranate extracts. -Non-Comedogenic: won’t clog pores. Good for ALL skin types including acne & rosacea prone. -Water-resistant: up to 80 minutes. -Gentle enough for kids 6 months and older. Its really the perfect product year round, but especially in the Summer Months! Second pick is something fairly new to me, but something I quickly fell in love with! That is the IT Cosmetics CC+ Radiance Vitality Brightening Crème Disc. ($38) I was never really a fan of cream products for the face before, but this 3 in 1 compact is so easy to use and provides a natural light weight look! As I already mention; in the Summer I like to keep things low maintenance, but I still want to look good. I dont want to pile on a ton of product just to sweat it off in 5 minutes. Which is why this compact has become a new favorite! It’s a Color Correcting Crème Blush, Crème Matte Bronzer & Crème Illuminator all in one that gives me a beautiful glow and flush of color that looks natural and blends seamlessly into the skin for a light weight feel. On top of all that, its infused with anti-aging ingredients such as hydrolyzed collagen, hyaluronic acid, peptides, acai, green tea, anti-oxidants and vitamins A, C and E. Amazing!!! Thirdly is a favorite water proof eye liner – the Urban Decay 24/7 Glide-On Eye Pencil. ($20) I included this rather than a mascara because I have yet to find a water proof mascara that I really love. A great waterproof eye liner is a fabulous option if you are possibly going to be getting wet or sweat a lot. You still get that great definition to make your eyes pop, but you dont end up with runny racoon eye mess that you would typically get with a mascara! Number 4 may not seem like a “beauty” item, but I assure you it is!! Eye protection is VITAL especially in the summer. I read that you eyeballs can actually get sun burned – isnt that wild!? Aside from that, do you notice how when it’s bright outside you find yourself squinting a lot more. All those squints you do start to create crows feet wrinkles… So you definitely want to protect your pretty little peepers with a cute pair of sunnies! I picked these ‘Lenny Black w/Strawberry Lenses‘ Sun Glasses from GlassesUSA to feature, because, well, I just thought they were cute! But also love that you can purchase Prescription as well as non-prescription Sunglasses from this website at a pretty decent price! Plus, they have an amazing feature that lets you upload a photo of yourself to the site, so that you can virtually try on the glasses to see how they will look on you. Love that! Fifth on the list is for Lip Protection! Anyone else find themselves with super dry chapped lips in the Summer time? I lip balm is honestly essential year round, but I still wanted to include it. And really there are many wonderful lip balms out there. My current favorite just happens to be the Burts Bees Lip Balms. ($3-$4). They come in a wide variety of ‘flavors’ each with different benefits to them, but they are all natural and formulated to moisturize, hydrate and nourish. Six on the list is the Hask Macadamia Hair Oil. ($3) This stuff if AMAZING! Its super affordable, and one little bottle will last for months. This hair oil is made to quench dry hair, adding moisture and shine. Its alcohol-free and rich in Omega 7, Vitamin E & Antioxidants, plus it absorbs quickly and doesn’t leave your hair feeling greasy either. My hair is already super dry and damaged as it is… Add in the fact that swimming in pools with all that chlorine and my hair feels like hay. YUCK! But this oil is a hair saver, keeps my locks looking and feeling soft and pretty! And lastly Seventh on the list has to do with the dreaded chore of Shaving! Its summer… We are in Shorts, Dresses, Swimsuits.. And Shaving is a necessary evil for most women. One of my favorite products for shaving is the EOS Ultra Moisturizing Shave Cream. ($3.49) I prefer it because its not a foam – its a cream! And its made super moisturizing like a lotion so you can actually shave wet or dry. Which is honestly amazing for me, because I ‘dry shave’ more often than not! Other benefits: its made with natural shea butter, vitamins B3, C & E, green tea and grape seed extract. Its also paraben and Phthalate-free free. And its supposed to keep your skin moisturized for 24 hours. Yes please!! Much love & hugs to you!! Bye Beauty Babes!! I'm a Jesus following, Disney-quoting, makeup loving, weight loss journeying, affordably fashioned, Zumba dancing, married, momma of three! With a passion for inspiring & encouraging others to look and feel their best. I believe beauty comes from within... With that in mind, I enjoy sharing the fun & confidence a little makeup can bring.